Yato’s sudden kidnapping by his father and the Stray has forced him into exile from Yukine and Hiyori. Fortunately for him, his father agrees to release him on one condition: he has to rescue ‘the conjurer’ from Yomi, the Underworld of the gods. However, when Yato arrives, he realizes the man his father was referring to is in fact Ebisu himself! As they struggle to complete Ebisu’s mission safely, forces above ground begin to take charge as Yukine and Hiyori search for Yato and the Divine Council grows suspicious of Ebisu’s activities. Noragami is a series that will likely hold appeal for a wide range of potential readers as it draws on fantasy elements to create a story both suspenseful and comedic. 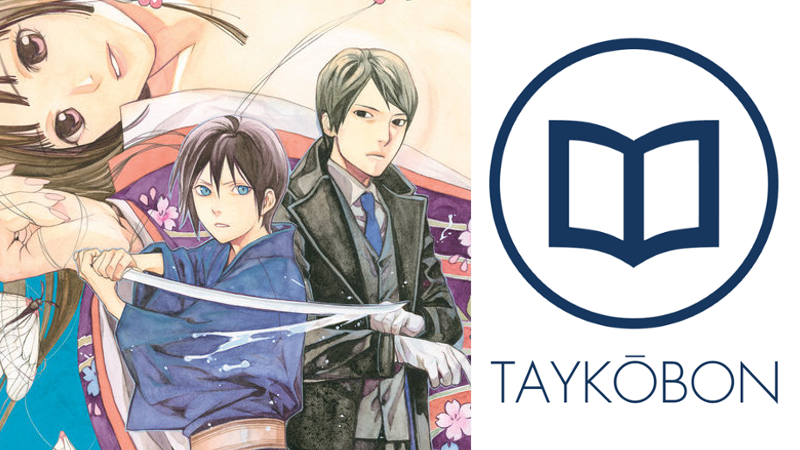 Following the arguably calmer period of story in the seventh volume, Noragami has once again picked up pace in its eighth and ninth entries. After Bishamon’s shinki crisis, things seemed to return to normal as Yato resumed his usual panhandling. While there were hints previously at more to come surrounding the introduction of Ebisu and Yato’s run-in with the Stray, the bulk of the new arc began in earnest starting with the eighth volume. Yato’s kidnapping and Ebisu’s secret dealings are just the beginning as the reasoning behind the events end up shaping much of the subsequent story. Bishamon’s story arc was relatively focused and action-packed, but the story has broadened its scope in recent volumes. Fortunately, this doesn’t come at the expense of intensity on the part of the action and dynamic events. The plot still moves quickly and effectively over the course of Yato’s time being held captive by Stray and his apparent father. Yato’s time in Yomi (which I can say is most similar to the Underworld in Western mythology) in particular is very engaging. The exploration of Yomi and Ebisu’s motivation while the struggle on the outside as the Heavens catch wind of Ebisu’s secret occurs creates two intertwined stories in similar style to earlier volumes that is particularly effective as both are equally interesting. Ebisu himself is a primary focus of the eighth and ninth volumes, and is in his own way the best part of them despite minor issues. He serves as an excellent character as he is far more complex than I would have originally thought. As a god of fortune, his desire to help humans has led him to pursue alternate ways outside of money. His interest in summoning ayakashi to perform his bidding is a result of this, and is the reason he dies so frequently as the ayakashi sting him frequently. However, while his frequent incarnations have led him to be more ‘liberal’ in social policies (such as employing strays), they have also led him to have a blatant disregard for his own life that thoroughly disgusts Yato. As a minor god who can’t afford to die, Yato places extra value on his own life. This influences his actions substantially around Ebisu, creating an interesting dynamic between the two as they attempt to survive Yomi. Although I did really enjoy this aspect of Ebisu, his progression from being willing to throw his life away to wanting to survive feels a bit rushed to me. That being said, his relationship with Yato is definitely appealing. As I mentioned earlier, at the same time that Yato and Ebisu are in Yomi, the rest of the cast and the Divine Council of the gods are facing their own battles above ground. Hiyori in particular has an excellent but short character arc. As a mortal, she realizes that she too will forget Yato over time without exposure to him, and struggles to remember him since he is missing for several weeks. Howevver, while Hiyori’s character arc was the most interesting, Yukine’s, in its own way, was the most fulfilling. The progress over time from whiny teen to dedicated blessed vessel has been steady throughout the series, but it finally fully feels like Yukine’s dedication has paid off. Although Yato is missing, Yukine’s continued studies and later face-off with a certain other shinki while looking for Yato really highlight his progression. The Divine Council, which was first introduced in the seventh volume, takes on a much more substantial role in the eighth and ninth volumes. After information that Ebisu is the conjurer is leaked, they go on a warpath and attack his home and shinki. By having the Council get involved, the world of Noragami feels more wide in the sense that conflicts are no longer confined to a small group of gods. Individual groups/members of the council, such as the seven gods of fortune, get their chance to participate in the conflict. I liked the increased involvement of multiple deities, especially as they end up fighting amongst themselves. Noragami manages to build more momentum in the new Yomi arc as the conflict expands to encompass the greater collection of Japanese gods. The two stories of the Yato/Ebisu struggle in Yomi and the conflict brewing above ground work well together and are engrossing. I wouldn’t say this arc has yet managed to get quite to the level of the previous one for me, but it definitely has a distinct appeal if you’re a fan of the series and seems to be going in a good direction. Noragami Vol. 8 & 9 were translated by Alethea Nibley and Athena Nibley and published by Kodansha Comics USA on November 17th, 2015, and December 22nd, 2015 respectively. The series is currently ongoing in Kodansha’s Monthly Shonen Magazine, and had an anime adaption by Bones which aired from January 2014 - March 2014 with a second season that aired in Fall of 2015. The tenth volume was released in English on January 26, 2016.